Expert commentary. Better solutions. Content you can trust. 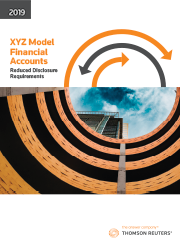 XYZ Model Financial Accounts provides step-by-step guidance in producing compliant financial statements, and preparing for the adoption of mandatorily applicable reporting standards. With recent developments and important changes to financial reporting requirements, it is important that you are working with up-to-date information so that you can stay one step ahead. You can be confident with guidance from XYZ Model Financial Accounts – over 30 years as the industry standard in financial reporting. Access the latest information to prepare financial reports that meet increased financial reporting regulation and complexities in the Australian market. This includes important updates for the new accounting standards, AASB 15 Revenues from Contracts with Customers, and AASB 16 Leases. The XYZ Model Financial Accounts product suite provides step-by-step guidance to produce compliant financial statements, and prepare to adopt mandatory reporting standards. Each component in the suite is available separately and depending on your needs, there are various subscription format options available including print and online on our Checkpoint platform. Commentary, guidance and model financial statements relevant to non-reporting entities required to produce special purpose financial statements. Commentary, guidance and model financial statements relevant to reporting entities required to produce general purpose financial statements. Designed to assist preparers through the December reporting period, as well as prepare you for the next year and beyond. Effective from 1 January 2019, the new standard will impact almost all businesses across Australia. To find out how Thomson Reuters can help you implement AASB 16 with our intuitive and easy to use Excel toolkit, please click here.